Phillip W. Magness » Why are so many English & MLA faculty fomenting hostility to academic freedom? Why are so many English & MLA faculty fomenting hostility to academic freedom? Last Friday evening an angry mob of protesters disrupted a scheduled guest lecture by American Enterprise Institute scholar Charles Murray at Middlebury College in Vermont. After interrupting the event and forcing Murray to deliver his talk by camera from a separate room, the mob turned physically violent. The protesters attempted to physically block Murray’s departure from campus and assaulted a faculty member who was accompanying him to a waiting vehicle. The episode is the latest in a string of campus incidents in which predominantly left-leaning activists have sought to silence and obstruct opinions on campus that dissent from or challenge their own political views. While a few of these episodes (including the recent wave of protests at Berkeley) have admittedly involved right wing provocateurs with little claim to advancing scholarly discussion, the attacks upon Murray involve a speaker who was targeted specifically over his academic work. Most of the activists involved in the attack appear to have been students, although the professor who was assaulted noted that she recognized some of her faculty colleagues participating in the effort to silence Murray. Murray himself similarly noted that the protests had been actively “encouraged by several faculty members” over the week before his lecture. 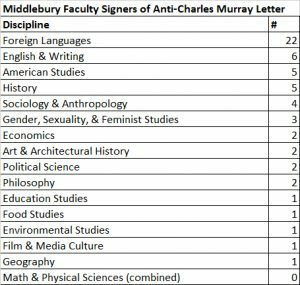 In one example that is frankly stunning given the unprofessional and anti-intellectual bigotries it revealed, several dozen Middlbury professors issued a public letter attacking Murray with a litany of grossly inflammatory charges. The same letter also specifically targeted members of the student club that sponsored the lecture, labeling them “responsible for explaining” the same inflammatory charges against Murray “to the College and the wider community” and accusing their membership of complicity in the same. Given that faculty members occupy a position of power in the classrooms and in their institutions, this letter’s targeting of a student organization represents a particularly egregious attempt to bully and silence the opinions of a political minority within the student body. Another disturbing pattern quickly emerges from the list of signatures on this letter. The faculty involved are overwhelmingly concentrated in the humanities and especially the MLA disciplines – the professors of English, foreign languages, and writing whose subjects of study fall under the purview of the Modern Language Association. 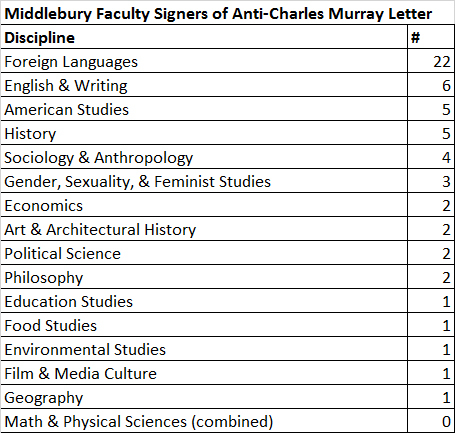 In fact, almost 50% of the Middlebury letter’s signers were faculty in English or a foreign language. By contrast, significantly fewer signatures came from the social sciences (the fields that are probably the most qualified to comment on Murray’s scholarship). Almost none of them teach in the hard sciences or so-called STEM disciplines. The lop-sided presence of the humanities is stark. Unfortunately it is also becoming alarmingly common – particularly in cases where groups of faculty have organized to oppose the academic freedom of fellow faculty and students on the political right, or on the free market end of the economic spectrum. A third example occurred a little close to my own home, George Mason University, last spring. This letter involved a faculty and staff attempt to block the renaming of the GMU law school after the recently deceased supreme court justice Antonin Scalia, as well as an associated naming grant to fund student scholarships and new faculty lines (multiple of law schools around the country are named after prominent Supreme Court justices including John Marshall, Thurgood Marshall, Benjamin Cardozo, Sandra Day O’Connor, and Louis Brandeis). The renaming and associated grant from a friend of the Scalia family were both unanimously endorsed by the law school faculty. A humanities-dominated letter signed by faculty and staff from departments with zero connection to the law school unsuccessfully sought to foment opposition – again on ideological grounds because they disagreed with Scalia’s conservative judicial philosophy. These letters represent only a few such episodes from the past year. In each case, a similar pattern emerged. The target of each letter was a group of other faculty who invited a speaker from, associated with a name from, or took research grant money from donors with a conservative, libertarian, or free-market political perspective. These perspectives were then deemed unacceptable on ideological grounds by a group of faculty in the humanities and particularly the English/MLA fields, who targeted the dissenting viewpoint for political ostracizing and harassment. More open-minded heads fortunately prevailed in the GMU and Wake Forest cases. At Middlebury, it helped in part to foment a violent and dangerous mob outburst. It is noteworthy that in each case the faculty instigators ventured well outside their own claimed areas of expertise, and into other departments and disciplines. Murray’s speech was co-sponsored by the Political Science Department. The GMU naming decision pertained only to the law school. The Wake Forest grant supported a business and legal ethics project. None of these areas of study are even remotely connected to the academic competencies of the vast majority of signatories on each letter. The pattern in each case is alarming, as it suggests that these and potentially other organized faculty-initiated attempts to impinge upon the academic freedom of their colleagues and their students are not randomly distributed occurrences. Instead they appear to concentrate heavily in the humanities, with English/MLA faculty invariably taking the lead. With that in mind, perhaps it is time to ask: why are so many English & MLA faculty displaying hostility to the academic freedom of their own faculty colleagues and students? I raise this question not to disparage English/MLA faculty or the humanities, but to express a pressing concern for what appears to be a growing ideological intolerance in these fields. The honest, open, and intellectually curious academics who remain in each should be the most alarmed by this pattern, as their colleagues are fundamentally damaging the scholarly reputations of their disciplines (and I’d say as much is also true of my own research area – history – which regularly ranks an unhealthy 3rd or 4th place on the same letters). When your colleagues cease to do scholarly work in favor of an agenda of ideological activism and even persecution, your entire discipline suffers from the illiberal reputation they create. 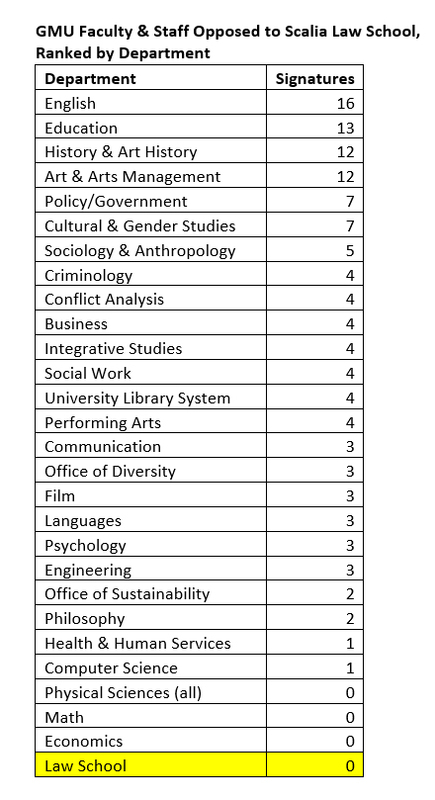 After I tabulated the original faculty breakdown for Middlebury by academic discipline, a number of people have asked how large each of their respective departments are on campus. Middlebury publishes a report on its undergraduate student body that offers a glimpse into how many students major in each of its academic disciplines. 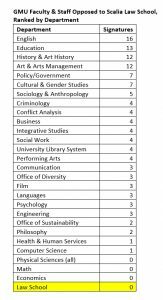 English and the other MLA disciplines fall under the college’s Languages and Literature division for a combined total of 166 declared majors. Even though these programs provided almost 50% of the faculty signers, their programs only represent about 11% of the Middlebury undergraduate student body. For comparison, the natural science departments (who had zero faculty signers of the letter) have 295 declared majors between them, or about 20% of the student body. Economics is one of the most popular disciplines on campus and had 221 majors as of the most recent report, or 14.7%. It had only 2 faculty signers though, compared to the 28 who came from English & other MLA disciplines. Taken together, these stats affirm the drastically outsized presence that English/MLA faculty as well as the humanities in general have on the faculty letter. 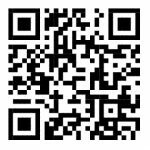 This entry was posted by Phillip W. Magness on Sunday, March 5th, 2017 at 11:55 pm	and is filed under Uncategorized. You can follow any responses to this entry through the RSS 2.0 feed. Both comments and pings are currently closed.